I recently tried to re-install Windows Live Essentials, but failed because the uninstall file wlarp.exe was corrupted. A quick Google research revealed that many other users had a similar problem. Microsoft even had a support page for this, but unfortunately the download link to wlarp.exe wasn’t working anymore. After failing to find a reliable source for the file, I remembered that I might still have it on an old notebook. I did, and the installation worked! The .exe file is zipped because WordPress didn’t allow me to upload an exe file. Thanks you so much for supplying this file, I needed it badly and it did the job! hi, you might have just saved me 🙂 many thanks and I love your life! Thank you so much! I was really struggling with this! Thanks for the file, it was what I was looking for to complete a manual uninstall. Cheers! I’m extremely grateful to you. Program stated, “There is a problem with one or more of your Windows Live programs…” It then gives the option to uninstall now–to which I chose YES. 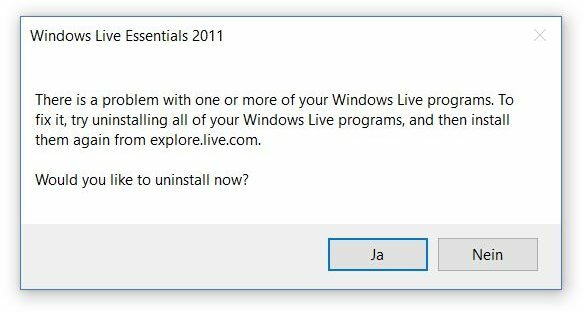 I don’t know about anyone else, but after the program ends–I would assume, since there were no errors of which to speak–that the Windows Live program(s) was/were successfully uninstalled. But, after attempting to reinstall, and receiving the SAME error–apparently, this was NOT the case! Personally, I’m tired of “bobbing for apples” in this scenario. I think it’s about time for the inevitable windows reinstall!!!! Geez!! Sorry to hear that. Hope you were able to eventually fix your problem.